Are these stripes dissolving or not? We put the candy cane in a glass filled with water, and then with oil. The candy cane dissolves in the water, making the stripes disappear. But sugar and corn syrup, the main ingredients in candy canes, don't dissolve well in oil. Even when the candy cane rests in oil for several days, the stripes remain. Meanwhile, the segment on the bottom eventually dissolves away, leaving a candy cane hook hanging from the side of the glass. Christmas candy cane optical illusion? No, we didn't slice this candy cane in half. Instead we put it in a glass filled with a layer of water and a layer of oil. 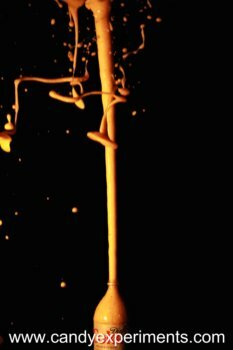 Since each medium (water, oil, and air) slows down light a little bit differently, the light bends a little bit where the air meets the oil, and where the oil meets the water. The result? A candy cane that looks chainsawed into segments. Do you still have a jack-o'-lantern on your porch? (We do, because this year's cold snap meant it froze instead of mouldering right away.) If so, you may want to check out the book "Rotten Pumpkin." This picture book shows us what happens to the pumpkin after Halloween, with mice, slugs, medicinal mold, and other forces of nature. A kid who likes candy experiments might just be the kind of kid who will look at this book and say "Cool!" instead of "Gross!" It's not Halloween ghosties or goblins doing the hissing--it's the Halloween haul! This Hershey's mini chocolate bar hisses in the microwave. Laffy Taffy experiments or Halloween breakfast? Just scrambled eggs with a little red food coloring, to make a nice orange concoction that shines like taffy. Solar Jack o' Lantern Power! How did you celebrate last week's partial solar eclipse? We flipped a pair of binoculars to project the eclipse onto paper, and turned the glowing crescents into jack-o-lantern eyes! It's not an M&M logo, and it's not an insect. This display from the Pacific Science Center's current exhibit of Ripley's Believe it or Not shows a life-sized model of a Amau Child Frog. As you can see, it's smaller than an M&M! I just got my advance copy of Candy Experiments 2, and it's beautiful! My oldest daughter is disappointed that I didn't give her credit for inventing one of the best experiments, how to use food coloring and a secret ingredient to turn a red and white gummy worm completely blue. So for the record--that one was her idea! My husband gave me this: a chocolate bar that had melted and cooled in the car. (He knew I'd love it.) Most of the surface bloomed, but patches stayed dark and shiny. Were these sections protected by the wrapper? Did they fail to melt? Or was there something else going on? Great news! 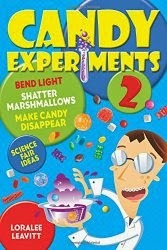 There's a Candy Experiments book giveaway at squareheadteachers.com, so head on over if you don't have a copy already. 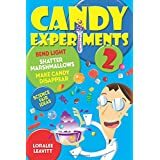 On another note, Candy Experiments 2 just got listed on Amazon, due to be released in December. I can't wait to see it! I did something unusual with the leftover Halloween candy tonight--fed some to a child. We were making s'mores and needed ingredients, so the sugar-free Peeps Valentine heart went on top of the Hershey Almond bar. The verdict? The chocolate melted first, marshmallow got a little bit melted, and the whole thing was devoured. The USA Science and Engineering Festival was a spectacular success! We taught our experiments, including Sink a Marshmallow, Acid Test, and Find Hidden Candy, to thousands of kids and their parents. I also did an author presentation, an author signing, and an interview on Sirius radio, so we've reached even more people to tell them that candy experiments are both fun and educational. We had great helpers, including my sister (teaching Find Hidden Candy), homeschool families, and my own family. My kids made great candy experiments teachers. Thanks to Impact Confections for donating super-sour Warheads! Just sent back the corrected manuscript for Candy Experiments 2. My editor made some good catches--I'm so grateful for another good reader to look over the whole thing so I don't make any weird mistakes. For instance, I almost told everybody that cotton candy dissolves faster than other sour candy. Candy Experiments 2 is on its way! This is the kind of chocolate news I like! A March article in the Los Angeles Times explains why dark chocolate has health benefits: apparently bacteria in the gut can turn an indigestible part of cocoa into anti-inflammatory compounds that are good for the heart and reduce risk of stroke. Always like hearing that I should eat chocolate! Candy experiments--and a crazy Cadbury video--featured in this article. I have been taking pictures of candy all day long--candy in oil, candy in water, candy out of water... Did you know it's REALLY hard to photograph glass? Here's one that may or may not make the book. In the box, this chocolate Easter bunny looks like way more than a kid needs to eat. But, because it's hollow, this 1.75 oz bunny only contains as much chocolate as this set of snack-sized bars. I've been exploring lots of fun things to do with Pop Rocks for the new Candy Experiments book, like watching the tiniest pieces bubble and float. Thanks to www.temptationcandy.com for their generous donation of Pop Rocks to the candy experiments cause! 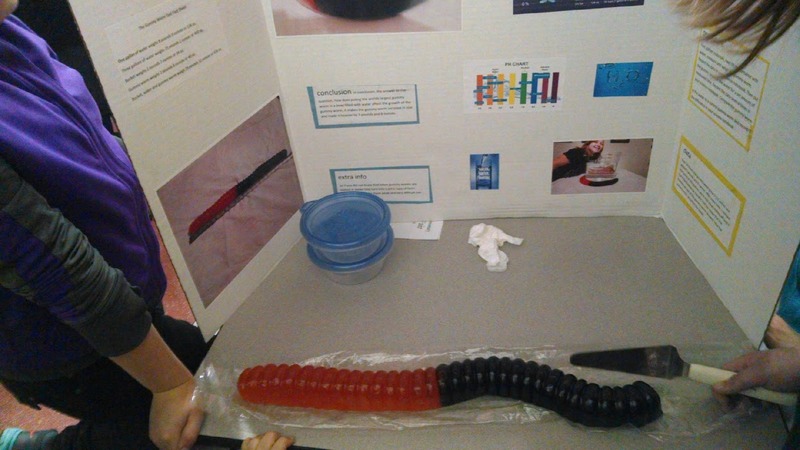 This was my very favorite science fair project at our school this year--a 26-inch gummy worm put into water to see what would happen. Apparently it more than doubled in weight, starting at 2 1/2 pounds, and absorbing 3 1/2 pounds of water! They said it didn't actually grow much in length, but they'd only had it in a bucket of water for the afternoon. Wonder what it would have looked like after two days in a bathtub? In the Dec 27 edition of the week, an article talks about microbiologists in Berlin who are working on probiotic-laced mints that fight tooth decay. Apparently the probiotics used for the candy, like those normally found in yogurt, can "attach itself to and neutralize" the bacteria that turns sugars into teeth-damaging acids. So one day, your candy might actually fight cavities instead of causing them! My daughter mixes Valentine colors as I work on an experiment for a new blog post. Gummi worms absorb so much water, and grow so much, that they turn translucent. Looking into the broken section of this piece of gummi worm was just like looking down a tunnel, complete with a ridged ceiling. Here's a fun density video from Mocomi.com, showing how honey, water, and oil form layers in a bottle. Even when they shake the bottle or turn it sideways, the layers reform because the honey, oil, and water don't mix. What would happen if you tried this with a Skittles density rainbow? It wouldn't behave the same way. The Skittles density rainbow works because each layer has a different concentration of sugar. Shake it up, and the sugar water mixes together and can't be separated. All that you're left with is a muddy brown. The Steve Spangler Geyser Tube makes a higher geyser than if you just drop Mentos in the bottle. Also, it's nice to be able to start the geyser from a safe distance away, so you don't get sticky. While Mentos make the very best geyser, bumpy Nerds jelly beans are a good runner up, because of the extra surface area. You'll find more information in Candy Experiments. This experiment has been around for years, and there are lots of fun versions of it on the internet. In 2005, Steve Spangler turned this experiment from a science classroom standard into an internet phenomenon with his original Mentos/Diet Coke video. Eepybird has done amazing feats with Mentos/Diet Coke such as this fountain or this appearance before Blue Man Group.